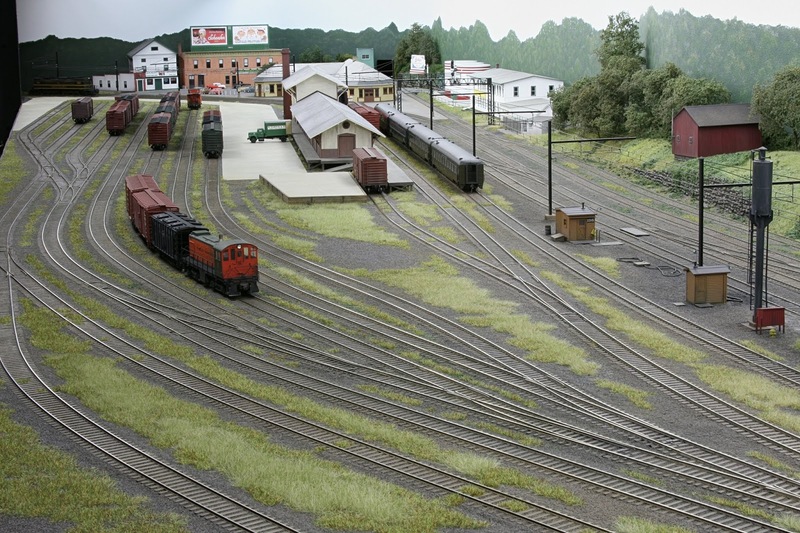 The Danbury Connecticut diorama of the layout is fully operational and nearing completion in this westward facing photo below. The remaining projects to do here are the details and weathering that are the fun things to be added as the layout matures. The eastward facing photo below shows near the same level of completion. Remaining to model are two small buildings and a diesel refueling rack that were located in the far east end of the yard just beyond the sand storage bin. These remaining structures that existed during the layout era are still being researched for modeling, while research continues layout construction will move north on the Berkshire Line to the next layout diorama at Berkshire Junction. Berkshire Junction is the location where the New Haven RR Berkshire Line branches in a northerly direction from the east/west New Haven RR Maybrook freight line. This junction point is 3 miles compass north of Danbury station, but for accuracy is considered eastward in New Haven RR timetables. The map below shows the location of the junction in relation to Danbury. This junction is also the location of this blog's namesake Signal Station 199 where the blog header photo below was taken by Leroy Beaujon in the late 1940's. Signal station 199 interlocking tower and accompanying coal shed will be modeled, the larger structures of Stearns Lime Co in the background would be in the operators isle and therefore not modeled within this diorama. The 3 miles of trackage between Danbury and Berkshire junction dates back to 1868, this was originally a portion of the New York, Housatonic & Northern Railroad Company a proposed alternate route to New York branching from the existing 1840 Housatonic Railroad at Brookfield Connecticut. 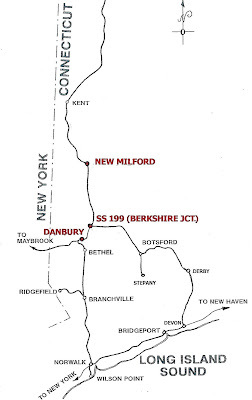 The 5 1/4 mile portion of the NY,H & N from Brookfield Junction to Danbury was the only portion of the road completed. The railroad acquired and graded an additional 23 miles south from Danbury into Westchester county New York but this portion was never finished. The Housatonic Railroad purchased the finished portion in the 1870's. Below is an original stock certificate gifted from a relative that was a descendant of the certificates bearer. 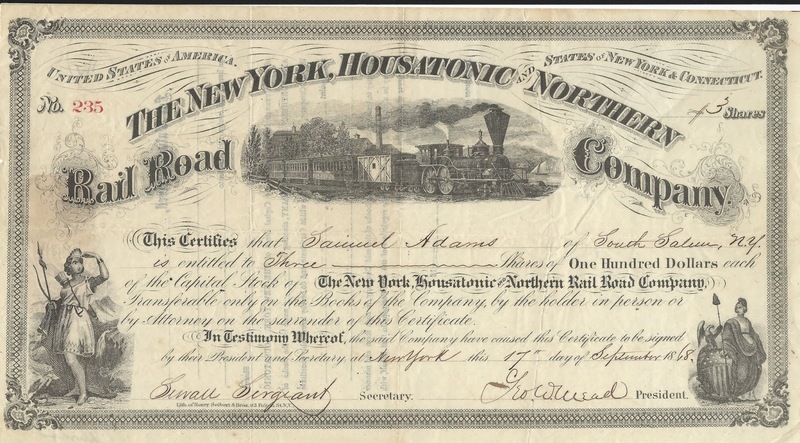 Assumption being these 3 shares of the NY,H & N were in lieu of land granted to the railroad in South Salem, NY that was graded but unfinished. The east/west New York & New England Railroad was built thru Danbury during 1881, this railroad joined a common grade with the original NY,H & N right of way at 3 miles north of Danbury where these two railroads then ran parallel from that location into Danbury but did not connect with each other. By 1895 both the New York & New England and Housatonic railroads were part of the New Haven Railroad, under New Haven ownership Berkshire Junction was established in 1908 at this location 3 miles north of Danbury. Steam era Pittsfield MA to New York train #141 is about to leave the Berkshire Line and cross over onto the west bound Maybrook Line at Berkshire Junction for the remaining 3 miles to Danbury station. The Maybrook Line gains elevation from the junction and curves to the east just above the RPO car in this photo. Also of note are the backsides of the junction interlocking signals controlled from the operator at SS-199. This recent photo taken at approximately the same location shows Stearns siding that was hidden behind the train in the above photo. Stearns siding was a location where Maybrook freight trains would drop or pick up cars for the Berkshire Line during the modeling era, these movements are included in the operational scheme of the layout. In this 1957 photo taken at Berkshire Junction the Danbury to Stateline MA symbol freight RI-2 with cars for interchange with the Boston & Albany at Stateline MA crosses over from the east bound Maybrook to the west bound Maybrook, then will cross over onto the Berkshire Line at a switch just beyond the lead RS-3. In the distance some or all of the cars sitting on Stearns siding may be picked up also for interchange with the Boston & Albany. This recent photo of Berkshire Junction faces south toward Danbury. This is again the track configuration at the junction after the New Haven RR installed CTC in 1961. After CTC installation the double trackage in this photo continued for 5 miles thru Danbury to the west side of the city ending at the fairgrounds, this double trackage segment remained automatic block signaled. 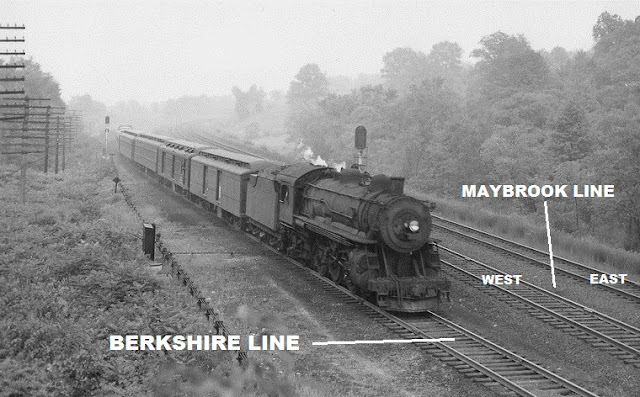 The Berkshire Line in the lower right was manual block controlled from Berkshire Junction to the lines northern terminals. Signal Station 199 was no longer in use after CTC was installed and the structures were removed. It appears there is a retaining wall between the conifer tree and the track in this photo, I believe this is where SS-199 once stood. There is 18 feet in length and 2 feet in width for this diorama on the peninsula portion of the layout. This photo below taken during early layout construction faces compass north at Berkshire Junction. 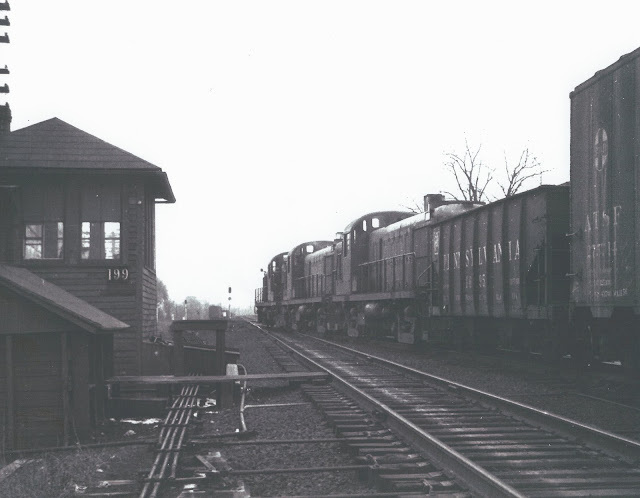 The crossover between the eastbound and westbound Maybrook tracks is in the foreground as in the above 1957 prototype photo, the switch to the Berkshire Line is just beyond. A caboose and boxcars sit on Stearns siding. As the prototype, the double track Maybrook Line starts to gain elevation at the junction then curves to the right. The Maybrook will then disappear off stage thru a backdrop into the helix beyond, climb 3 turns to a return loop staging yard on the opposite side of the layout peninsula. The Berkshire Line will also enter this helix but go down 1 1/2 turns to the next northern diorama on the map New Milford CT, this is also on the opposite side of the peninsula where the orange handle clamp is in this photo. Since the above photo was taken a masonite fascia and backdrop have been installed along with an extruded foam board "sky" covering the benchwork above. 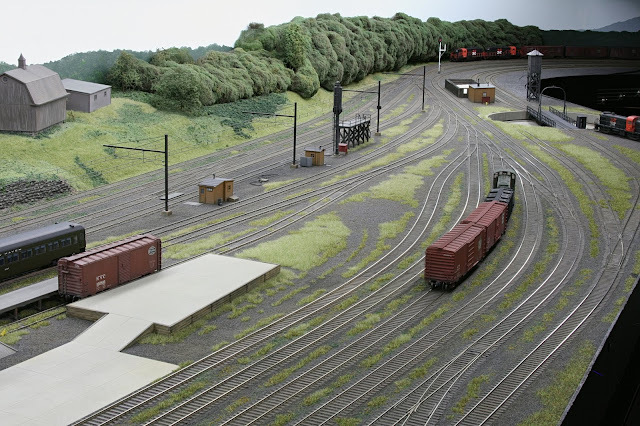 The first step to bring this diorama to completion will be to build, wire and install the signals that were at the junction during the era of the layout. Looking great Joe! Thanks also for the history of the area! Nimke talks quite a bit of this area in his 3 volume work on the CNE.